This week my daughter, Kayla, is our guest columnist. 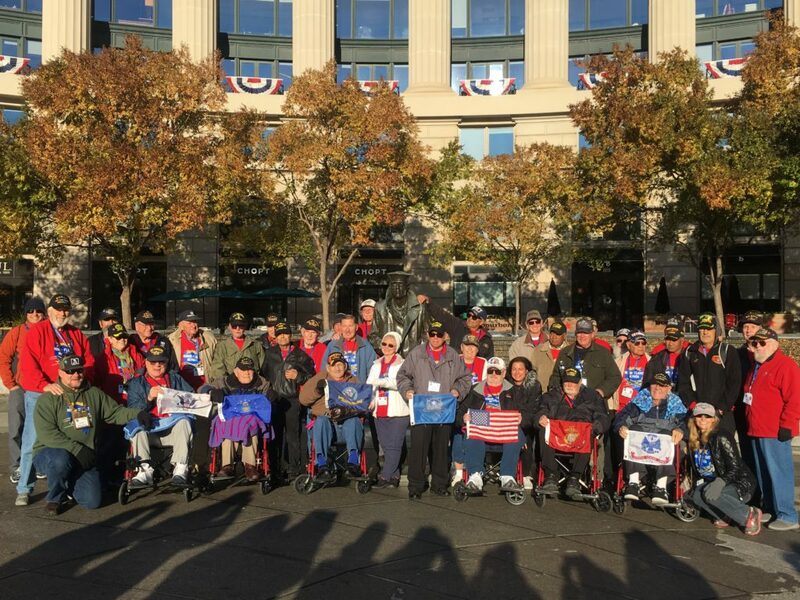 My whole family had the privilege to go on the Honor Flight on Veteran’s Day weekend. This was my second trip. 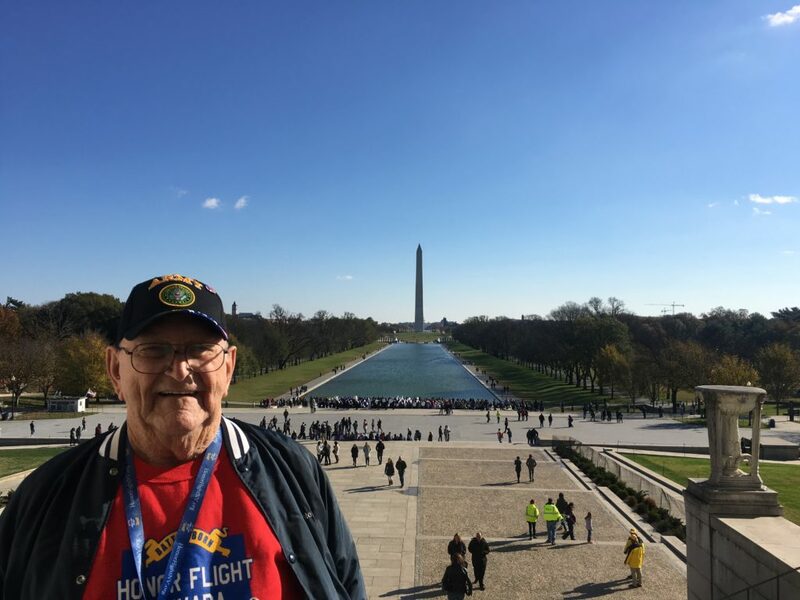 Through the donations of many generous people, Honor Flight takes veterans to Washington, D.C. at zero cost to them and tours them around their own war memorials. This trip was just as amazing as the first one and I see many more in my future. This is Kayla’s perspective on the experience. I push Dutch in his wheelchair along The Vietnam Wall. We’ve just stared at a statue of three soldiers, one of which has a machine gun perched on his shoulder. Dutch tells me about the third time his helicopter was shot down in Vietnam. The helicopter crashed into water and a guy with a machine gun was suddenly laying on top of Dutch, making it hard for him to escape this quickly-sinking helicopter. I try to put myself in his shoes and experience what he must have felt, but it’s impossible. I have no way to relate. Dutch wants to find two names at The Vietnam Wall Memorial. One was around my age (26) when he was killed in combat. We find his name in a sea of more than 58,000 names of lost soldiers, and I am honored to etch this man’s name onto a piece of paper with charcoal so that Dutch can remember him. The second name is the name of a man Dutch personally sent onto the battlefield. He was only 19 years old and he died that day. Dutch was asked to identify his body. Dutch doesn’t remember his first name, and isn’t sure how his last name is spelled, only pronounced. We try all different kinds of phonetic combinations to find this name and eventually find it. At this point, Dutch says to me, “Young lady, if you have something you’d like to see, you can go see it. I’d like to be left alone for a while.” I take the opportunity to walk away from the crowd so people don’t see me crying — I cry for the fallen soldier I’ve never met, and for Dutch’s survivor’s guilt. At breakfast the next day, I ask Dutch what special coin he laid at the memorial near these names. He tells me how he got a bunch of Presidential dollar coins when they first came out, but they were rendered useless soon after. Now he carries a handful of Presidential coins on him at all times and hands them out to children whom he sees doing good deeds. He gifts me one for accompanying him at the memorial, which makes me fight back tears again. Here’s a photo of us after this moment. Don’t look at my puffy eyes! Kayla and her new buddy, Dutch. Dutch is among several veterans I met when I spent three days with more than thirty veterans from World War II, the Korean War, and the Vietnam War. I signed up to be a “Guardian” through Honor Flight Nevada, an organization that arranges for vets to fly from Reno, Nev. to Washington D.C. to visit their own war memorials. The trip is completely free for veterans. I didn’t know any of the vets at the beginning of the weekend, but by the time we flew home to Reno on Veteran’s Day, I looked around at this group of people with whom I had deeply connected and already knew I would miss them. Not all of my experiences were sad ones. A veteran named Ernie sat by me on the flight to D.C. and we became fast friends. He told me about the different arts and crafts he works on at home; he builds nativity scenes, crosses, and bird houses out of petrified wood. I learned all about his family life, including how his 26-year-old brother was killed in a motorcycle accident one year after joining the police force. At the WWII Memorial, Ernie and I knew we had an hour before we had to get back on the bus. He’s a fast walker and fairly healthy, so we decided to make the trek over to the Lincoln Memorial, which we both really wanted to see. We walked back to the bus with plenty of time to spare but realized everyone was already on the bus and waiting for us! Apparently, we weren’t supposed to wander off, and we were reprimanded for it, but Ernie and I wouldn’t have gotten these lovely pictures otherwise, so we didn’t regret our prohibited excursion. We bonded over this moment of mischief and it became our inside joke for the rest of the trip. 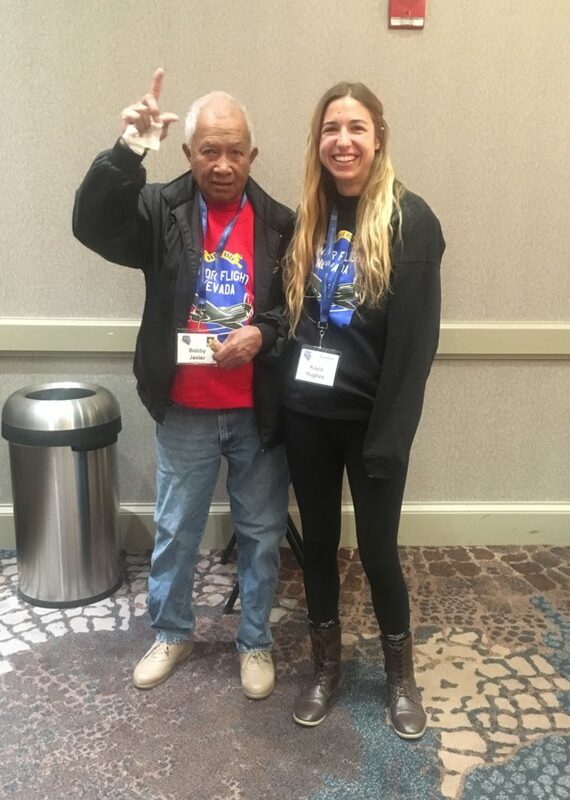 Kayla bonded with veteran Earnest Bugg, and the two went off on a mini-excursion to see the main D.C. sights. But it was Bobby, a Korean War veteran, who really stole my heart. Bobby is pretty mobile, considering he was shot in the leg and has large pieces of alloy in his leg. He had to go to physical therapy for a year before he could walk again and couldn’t return to skiing for another 5 years. He loves skiing and was ski patrol at Squaw for 15 years. But the war left a lasting impact. He told me he had a 3-to-5-year period after the war where he completely isolated himself, even from his wife. 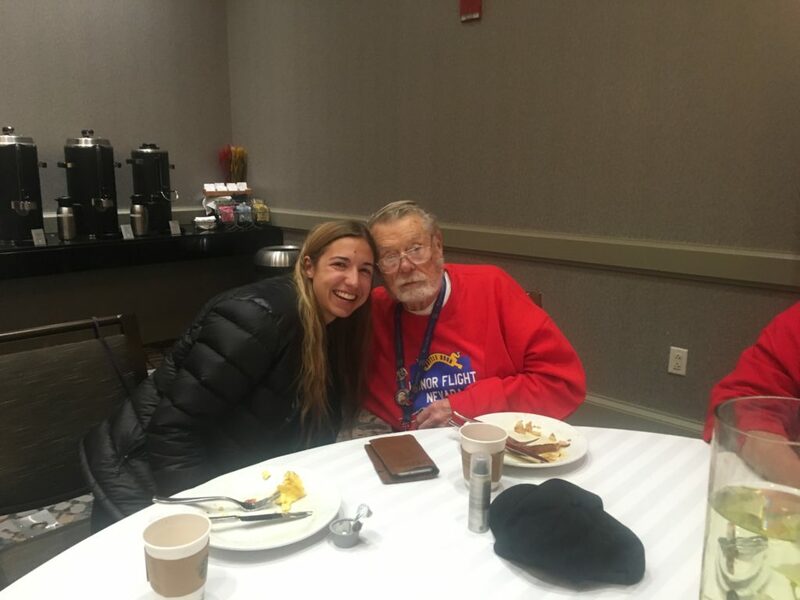 Here is Kayla with Bobby, who provided no shortage of laughs during the trip. When you’re a 26-year-old American woman living in 2018, like me, the hardship you’ve experienced is negligible. I clearly remember 9/11. I was in 4th grade and was old enough to feel an enormous loss for my country, but living in Reno, it still didn’t affect anything about my day-to-day life. I lived through the Great Recession, but being a teenager, I just complained about high gas prices and didn’t know the real turmoil older generations went through as they lost everything they had worked for. The War in Afghanistan is part of my lifetime but hasn’t affected my life in any noticeable way. I work mostly from home in my PJs, in a job I might love a little too much. I live in a cute little home with a white picket fence in midtown with my boyfriend. We play volleyball regularly, cook together, go out to eat with friends and family, go to music festivals, and basically do what we want when we want. We’ve attended four weddings this year, one of which was in Mexico, one in Germany, and have yet another wedding coming up in the British Virgin Islands. What a hard life. The reason I’m able to do all this can be traced back to a single priceless foundation: my freedom. I owe my beautiful life to all the men and women who sacrificed themselves for me and my freedom. I can easily say it was one of the best weekends of my life, as it reminded me how lucky and proud I am to be an American.